Will India Ally With Russia, China and Iran Against the West? India is being pushed/enticed to join a growing neo-communist bloc on two fronts. From below the pressure comes from an allegedly Chinese/Pakistani backed Maoist insurgency that effects a third of the country. From above, India is being lured into the Chinese/Russian led Shanghai Cooperation Organisation with promises of economic and energy rewards. The influential Communist Party of India (Marxist) is playing a leading role in the pro-SCO lobby. BEIJING, March 20 (RIA Novosti)-Cooperation between China, Russia and India will benefit global as well as regional development, Chinese leader Hu Jintao said Tuesday. "Trilateral cooperation between China, Russia and India is not aimed against any third party, and is beneficial for the development of these three nations and that of the world at large," Hu said in an interview with Russian media. He said China, Russia and India, which play an increasingly important role in the global arena, have shared interests and see eye to eye on many key issues of international concern. "All three countries advocate a multi-polar world, the democratization of international relations, and the preservation of world diversity; they want international issues and interstate disputes to be settled on the basis of universally accepted norms of international law and seek a consolidated role for the United Nations," said the Chinese leader. 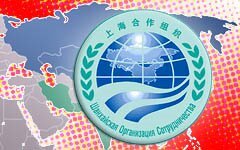 China, Russia, and India cooperate, specifically, through the Shanghai Cooperation Organization, a regional security alliance currently composed of six full member states and five observers. 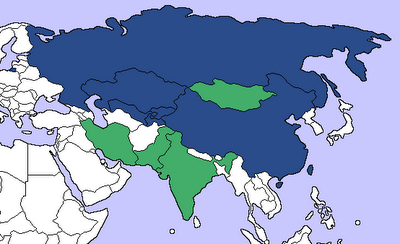 According to the Chinese leader, the SCO is now preparing a document on further expansion. Its full-fledged members include China, Russia, Kyrgyzstan, Kazakhstan, Tajikistan and Uzbekistan; India, Iran, Mongolia, Pakistan and Afghanistan have observer status. Should SCO expand to include India, Pakistan and Iran, it will encompass not only the bulk of the world's population, but two of the world's fastest growing economies and a huge percentage of the world's known oil and gas reserves. It will also become a hugely significant military bloc. The SCO is allied with most of red Latin America and South Africa and will be able to exert huge political, miltary and energy pressure on the European Union. Of course Russia, China, Iran and India would never use this tremendous power against the West, would they? That map reminds me of Pax Mongolia. It seems that China, Russia and Iran are the ones eager for this SCO block...... As for India, its not capable of taking an independent foreign policy initiative, if sometimes its pressure from the West, at other times its the domestic Muslim vote bank....... but only this block (incl India) has the potential power to overturn the Western (US-EU supported by the International Banking Elite which imposes the present world financial architecture) power block..... it does look like a revived Pax Mongolica..